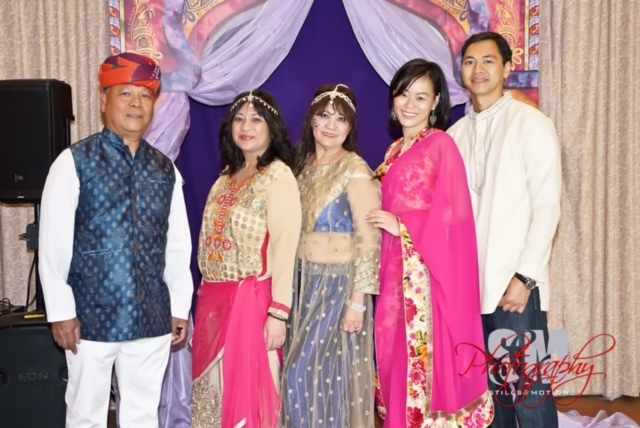 Speaking of creativity… My mom hosted her 70th birthday party last month at the Hilton. It was a costume party with a Bollywood theme. She put it all together, the centerpieces, giveaways, and party gifts. She even did a Bollywood dance with her friends. The costumes were all very colorful. It was festive like all my mom’s parties. It seemed like everyone was having a good time dancing (ballroom and line dancing), taking goofy photos at the photo booth, and getting henna tattoos. I didn’t stay the whole night because of my back problems and arthritis, but I was there for awhile. It was a long day and I even got my hair done at the salon with my mom. The costume was all my mom’s idea, but I didn’t mind because the day was all about her. Anyway, here’s a picture of me, my parents, my sister-in-law Elsa, and my brother Eric. Eric and Elsa also brought over their six-month-old puppy when they were in town for the party. 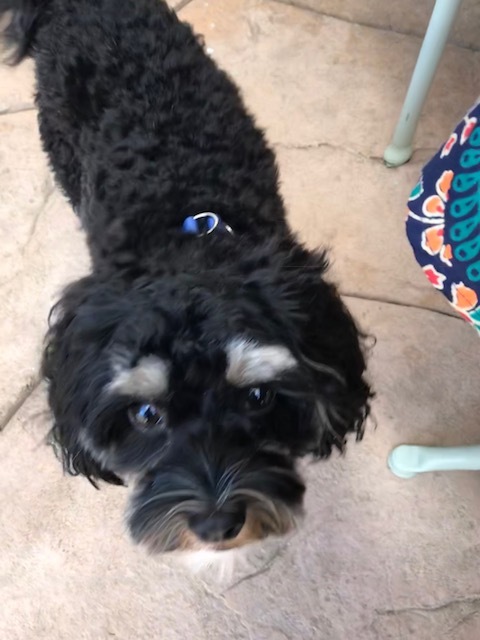 Cammie is a Cavapoo, which is a cross between a Cavalier King Charles Spaniel and a Poodle. She’s so cute and funny, and she knows a few tricks like sit, down, and shake hands. Shake hands was the best and made me laugh and feel happy. 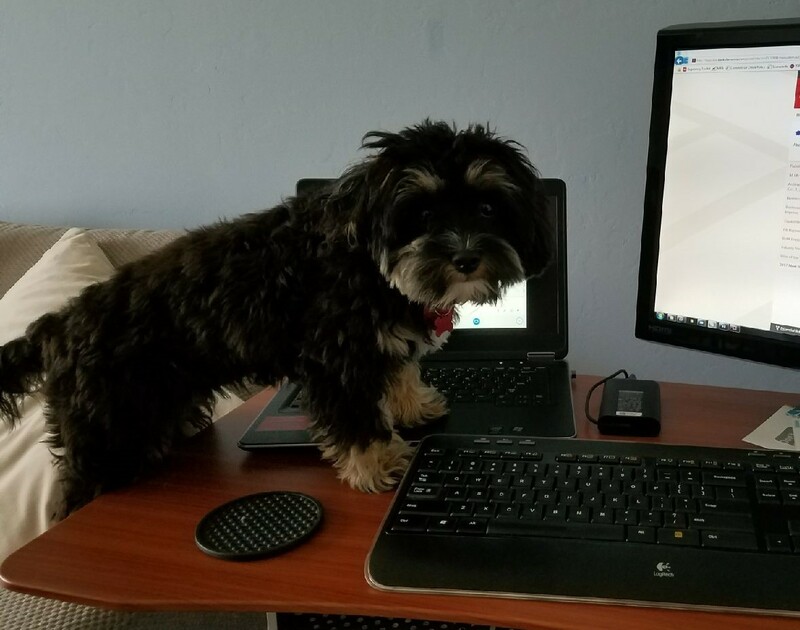 There she is walking all over my brother’s workstation in order to get his attention. Things are somewhat back to normal with me and my parents. I am not angry anymore. I have been directing my thoughts toward writing, and am not going to worry about the disability review for now. Well, the news is that we returned Harley to the breeder. I was just stressing out too much and the pain from arthritis was not improving, especially in my hip area. I think I really tried with Harley, even took her to puppy class. My parents were helping me out as well, but it was all just too much for us. I felt that Harley needed more time and attention, but I was constantly in pain. After we returned Harley, I saw my doctor again, and she referred me to physical therapy. I really want to get better, especially because my mom’s 70th birthday party is coming up in June. I am improving a little and feeling less pain, but I am still spending a lot of time in bed resting. My mental health is a bit more stable though. I haven’t been doing any of the things I used to do before I was diagnosed with arthritis. Haven’t been playing WoW, haven’t been writing, haven’t been reading that much, though I have been listening to more audiobooks and I continue to update my romance book blog. As a consequence of my current quality of life, I have been watching a lot more TV. LOL. I watched Supergirl Season 1 on Netflix and used my 7-day free trial of Showtime on Amazon to watch Homeland Season 6. I also wake up every morning wondering if Trump got us into war while I was asleep. So, 2017 is way more awful than 2016, and the Trump administration is truly scary. I’m just glad I have my family and few friends on/by my side.